UV lenses utilize specific substrates, anti-reflection coatings, or a combination of the two to maintain performance when operating below 400nm. Many optical lenses that perform well in the ultraviolet may also have strong performance in the visible, near-infrared, or infrared spectra. 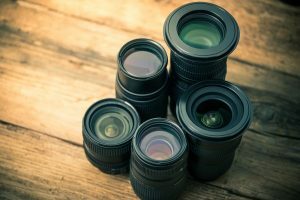 Lenses are used primarily to focus or diverge light, either as a single component or as part of a larger array. Convex lenses focus light to a point, whereas concave lenses diverge light away from the source. The focal length of any lens is dictated by its diameter, radius of curvature and the refractive index of the material. Simply put, materials with a high refractive index such as germanium (n=4.0) or high index flint glasses allow a lens to achieve a specific shorter focal length with a smaller diameter than the same lens made with a material of low refractive index. Materials also transmit in different wavelengths. Taking germanium as an example again, UV and visible wavelength are blocked making the material appear opaque, but it allows IR transmission. This makes it undesirable for systems where UV or visible ranges are required. It is well known that UV light has properties that make it a very powerful investigative tool in the study of forensics, particularly because it makes many substances fluoresce. Less well known is the power of reflected-UV imaging to reveal hidden evidence. Absorption: UV light is highly absorbed by many commonly encountered organic materials, yet it is reflected by many inorganic materials like stone and metal. If these organic materials are on a surface with higher UV reflectance, the substances will often stand out more strongly than visible-light or near-IR images. The reverse is true as well – traces of inorganic materials like salt stand out as bright on a dark organic surface like a wooden table. Lack of penetration: UV light does not penetrate even very thin layers of materials. This makes surface topology more apparent, since normally, a translucent surface appears opaque. The high energy of the UV photons makes them interact strongly with the electrons in atoms and molecules. Many materials look very dark when imaged with UV light. Highly scattered UV waves: UV light waves have a short wavelength, which means that they are scattered much more readily by small surface imperfections on a smooth surface than either visible or near-IR light. Scratches and dust are much more apparent, which is why the optics industry uses UV imaging to inspect lens surfaces, for example. Some of the texture imaging can be accomplished by raking-illuminated visible-light photography, though UV has advantages over raking light. At Universe Optics, our line of Ultraviolet Quartz Lenses is designed for imaging in the deep UV spectrum. These UV Quartz lenses are optimized for 266nm wavelength. Available from stock in 6,9,12, 25, 50, 78, and 105mm focal lengths, these precision lenses are well suited to forensic investigation and other UV and Infra-red imaging applications.